Everybody at least once caught himself in front of the scary white wall of writing. It requires a certain push (some call it inspiration) and some magic. Even starting to write this post took me some 20 hours of waiting and thinking, ‘Do I really know what I want to write? Is it really necessary to write it now?’ and so on, you got the picture. My idea is to illustrate and talk about the difficulty of writing with the following scene (see also the general picture below): A bicycle is positioned on a stand, and once someone sits on it and does some paddling (which would be made particularly hard by tightening the brakes), the dynamo with generate power for a front light. The light then points at a typewriter on a chair (or desk). The movement of the bike paddles would activate a metal arm, which would then start typing randomly on the typewriter. Simultaneously, a radio would start playing audio interviews and opinions of famous writers on the difficulty of writing, writer’s block, and writing in general; my idea is that the speed of the bike paddles would control the rate of the audio (the playback speed). So at the beginning, while the bike moves slow, something like “Wriiiiiitiiingggggg issssss liiiiiiiiiiiiiiiikeeeeee…” would be heard. “My passions drive me to the typewriter every day of my life, and they have driven me there since I was twelve. So I never have to worry about schedules. Some new thing is always exploding in me, and it schedules me, I don’t schedule it. It says: Get to the typewriter right now and finish this. Well, that should be enough for sharing here. A good interview with screenwriters is here “Screenwriters on writer’s block“. Another great source is the BrainPickings blog. 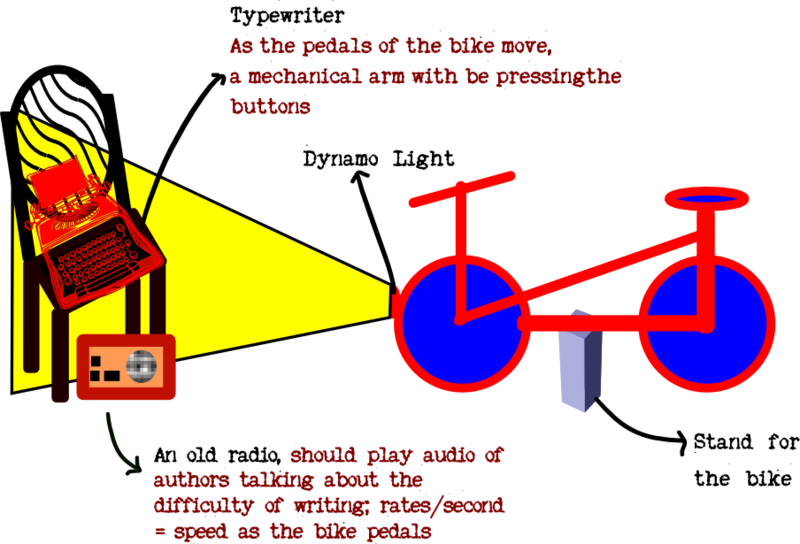 I am also thinking about how to make the playback speed/bike speed without using electronics. Would a gramophone work? Hmmm, any ideas are appreciated. I would also try and find in a library recorded interviews with authors on the topic, otherwise maybe I would need someone to read the quotes.